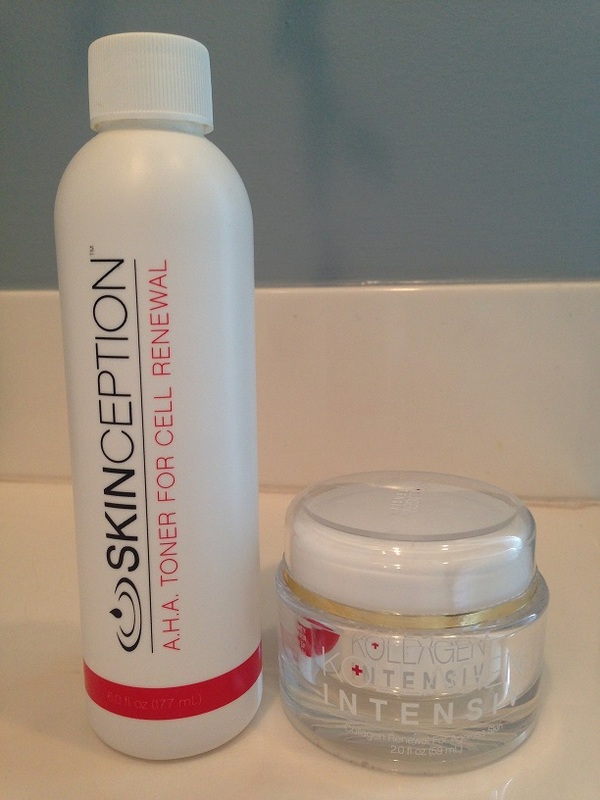 Using Kollagen Intensiv with Skinception AHA Toner – A Powerful Combination! 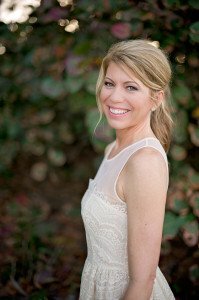 If you’re familiar with WomensBlogTalk, you’ll know that Kollagen Intensiv is one of my top recommended anti-aging wrinkle creams and I’ve personally experienced results using it. Recently I decided to change up my anti-aging routine and I’ve been using Kollagen Intensiv with Skinception AHA Toner to see how the two would work paired together and I have to say the results are outstanding. Pairing a toner which promotes collagen production with a moisturizing cream which also promotes collagen production has really made a difference in my skin! I’ve been trying this combination for the past few weeks now to see if it’s something that I would recommend and I’ve definitely seen an improvement in the overall texture and appearance of my skin. My skin is softer, smoother, more plump with diminished wrinkles, and my pores are noticeably smaller on my nose and cheeks. In this review, I’m going to explain the importance of a toner and also talk about how using Kollagen Intensiv with Skinception AHA Toner works so well together. Skinception AHA Toner is a multi-tasker; it removes excess oil and makeup, shrinks pores, and brings your skin closer to a correct ph level with a minimal alcohol content. After cleansing, using a toner can really get into those pores to remove any remaining residue. Have you ever washed your face, and then used a toner and seen even just a “little” bit of dirt and grime left on the cotton ball? This leftover dirt and debris is what enlarges your pores and creates an environment desirable for pimples to form! Using a toner removes what your cleanser leaves behind, allowing your skin to breath and allowing your anti-aging treatment to penetrate at a much deeper level. 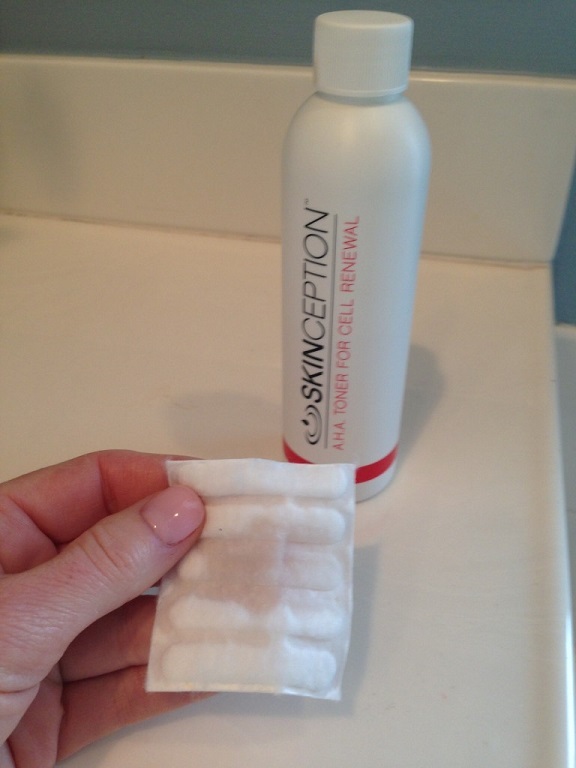 Skinception AHA Toner is not your average toner and I’ll explain why. Some toners are very mild, with no active ingredients and feel nothing short of sweeping rose water across your face. Skinception AHA Toner contains multiple potent fruit extracts such as bilberry, goji and chokeberry which are able to penetrate at a cellular level to promote collagen production. Skinception AHA Toner Ingredients also contain aloe and cucumber to sooth and nurture the skin while protecting from harmful toxins which age the skin. Skinception AHA Toner is very refreshing and has a light citrus scent from the grapefruit and orange peel oil it contains. When you apply the toner you can really feel it working! I feel a cooling sensation (but no burning) when I use it and allow it to dry just for a minute or so prior to applying Kollagen Intensiv. During those couple of minutes, it does make my skin look a little bit flushed, but this subsides quickly leaving a youthful glow. I would say on a scale of 1-10, with 10 being a toner than tingles or burns to the point where you have to fan your skin (such as Peter Thomas Roth Glycolic Toner), this one is about a 3, so I wouldn’t consider it harsh by any means. In order to get the optimal results from your anti-aging treatment, you must create an environment conducive for deep penetration. Skinception AHA Toner does a great job fully cleansing and prepping the skin and bringing it to an optimal ph level in which to apply Kollagen Intensiv. 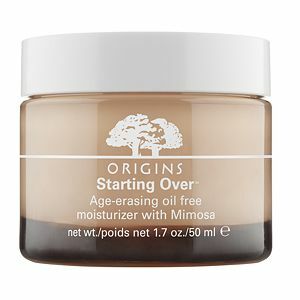 By removing all of the debris with the toner, your pores are able to breath, opening up the pathways leading down into the deepest layers of your skin and giving the moisturizer an easy route to follow in order to work most effectively. Both Kollagen Intensiv and Skinception AHA Toner are collagen boosters, so they both work to reverse the signs of aging by moisturizing and plumping up those wrinkles with renewed cell production. By the time you apply the Kollagen Intensiv, the toner has already “primed the collagen pump” and by using them both together, you now have two effective products working towards the same goal of plumping, firming and reducing all signs of aging. Applying Kollagen Intensiv immediately after Skinception AHA Toner also just feels good. Kollagen Intensiv is a very soothing and highly moisturizing product so when you apply it, it works quickly to neutralize and calm the skin. It’s really a nice combination and I’m so glad I tried these two products together! 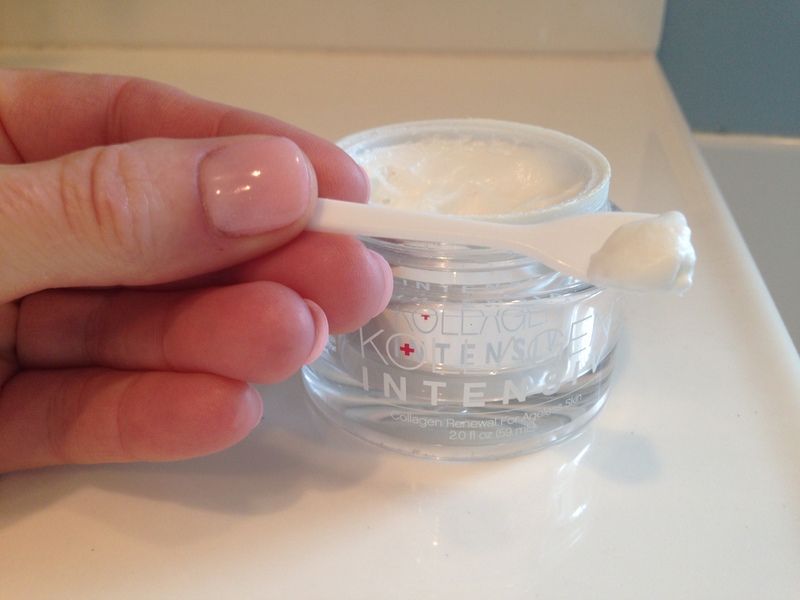 If you haven’t already, you can read my personal review on Kollagen Intensiv to learn about my experience and results using this moisturizer. 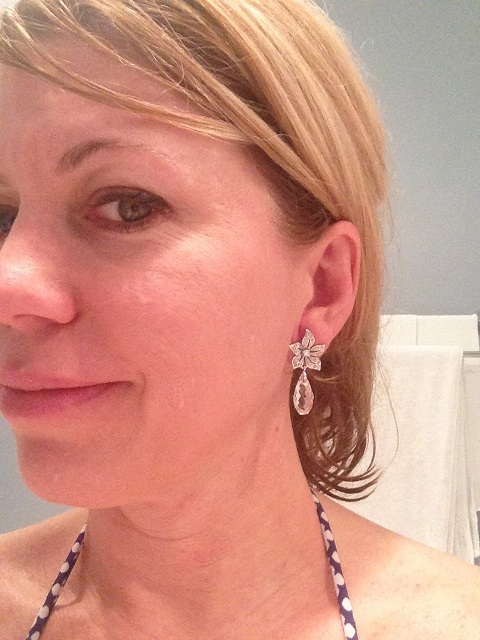 A little pink, but fresh faced, no makeup using AHA toner + Kollagen Intensiv, dark spots gone. Using Kollagen Intensiv with Skinception AHA Toner proved itself to be a powerful combination which you can use daily for optimal anti-aging results. I’m very pleased with my “accidental” discovery of how well these two collagen boosting products work together to soften my wrinkles and shrink my pores. The toner is refreshing and works to create the perfect ph balanced environment in which to apply the moisturizer so that it’s able to penetrate at a deeper level rendering it more effective, and I already knew that I loved Kollagen Intensiv for its ability to plump up wrinkles and reduce dark spots! Both of these products are affordable and can be purchased easily online, they are not available in retail stores. Kollagen Intensiv is $59.95 for a 2.0 oz tub and Skinception AHA Toner is only $39.95 for 6.0 oz bottle. You can actually order both (or one or the other) in the same shopping cart from the Skinception Anti-Aging Store and they do offer savings if you order more than a one month supply. 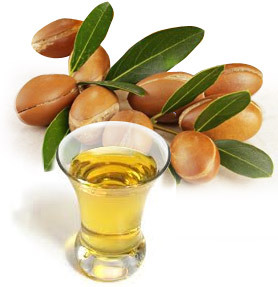 Skinception Argan Oil – who doesn’t love an all natural anti-ager? Have you tried Kollagen Intensiv and Skinception AHA Toner Together? Leave your questions or comments below! It works, been using it on my face, neck and chest and after a few weeks I'm noticing a real difference in the appearance of my wrinkles. Everything looks much smoother and plump! AHA Toner is my new favorite! Rachel, you weren't kidding. The AHA toner does a great job without being too harsh. I've noticed a quick improvement in the texture and tone of my skin. It also removes any lingering dirt and debris from just washing my face. I couldn't believe how much came off on the pad. My wrinkles are less noticeable and my face has a fresh look. I haven't tried the Kollagen cream but that's my next step. Thank you, love your blog. Keep up the good work! 5.0 5.0 2 2 It works, been using it on my face, neck and chest and after a few weeks I'm noticing a real difference in the appearance of my wrinkles. Everything looks much smoother and plump! 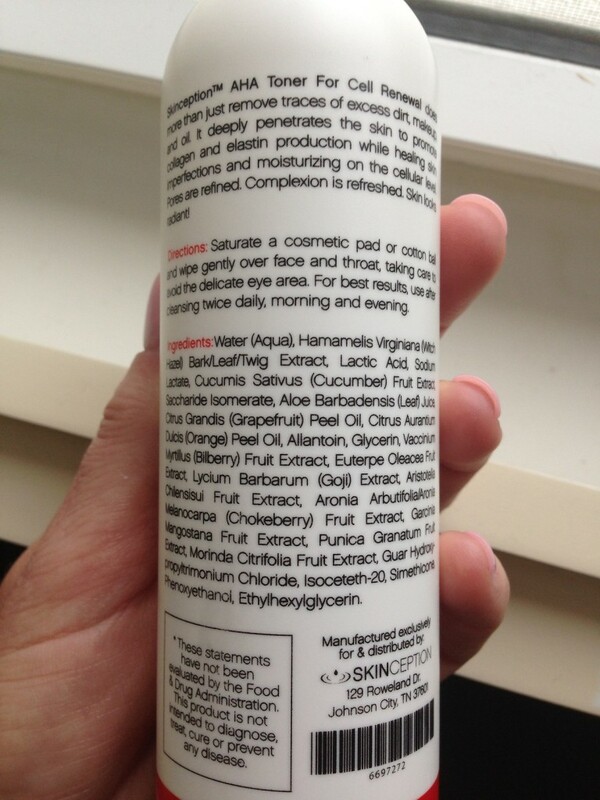 Using Kollagen Intensiv with Skinception AHA Toner – A Powerful Combination! 1 out of 2 people found this question helpful. Tried the aha toner and love it. My skin feels more firm and the texture is smoother, less lines and wrinkles. Really a nice product and different from any toner I’ve used. It doesn’t strip my skin.